Last weekend was the weekend when I normally make my Christmas Cake and I started to make it (promise) but on Sunday morning a little tomfoolery happened and I ended up with some hungover cupcakes. I had put dried fruit into a bowl to soak in a nice soothing bath of whiskey with a dash of fresh orange juice on Friday evening. By the time Sunday came around I was attempting to bake my normal Christmas Cake recipe but was totally distracted by my hubby who had a roaring hangover after being out with the lads the night before and our 2 boys were lamping (technical Dublin term don’t you know) around the kitchen. So I decided to be nice and make him an expresso. Except instead of putting the expresso into the cup to go with some steamed milk, it ended up instead in the mixing bowl. From there the cake making descended into a bit of silliness as I tested and retested the new recipe which included coffee intended for the hungover one, and some various other bits and bobs I’d added along the way. What has resulted is a moist mini Christmas Cake which freezes exceedingly well. Yes freezes! So you can make it in advance of time and defrost the day before you want to serve these up. 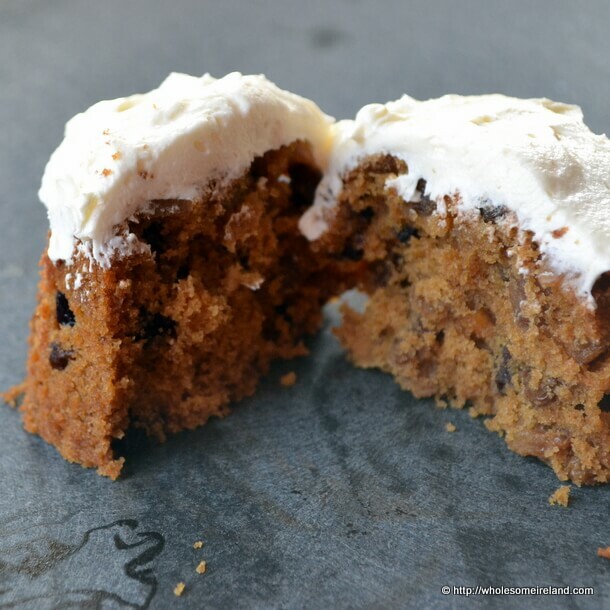 So if you’re trying to get ahead of the Christmas rush, these little cakes are perfect for making now, freezing and wowing your guests over the holidays. 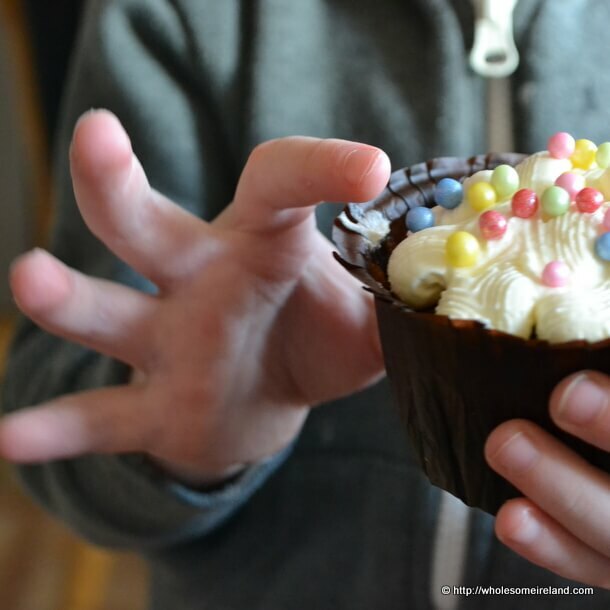 Today I was ably assisted by the 4 year old when taking my photographs, he is responsible for the liberal sprinkling of candy balls on top of the cupcakes. 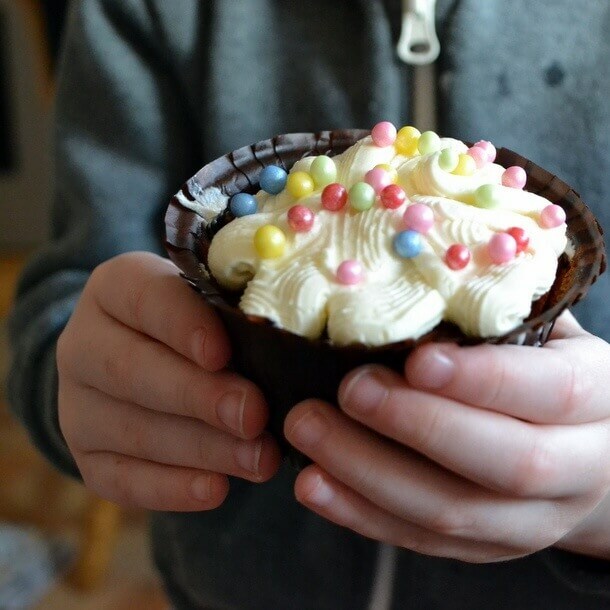 When I was going through the memory card before uploading the pictures, I discovered this funny picture of him trying to stick his finger in the icing to taste it, hence there are smudgy bits on the sides of the cases. Sure that’s what real kids do? Right? 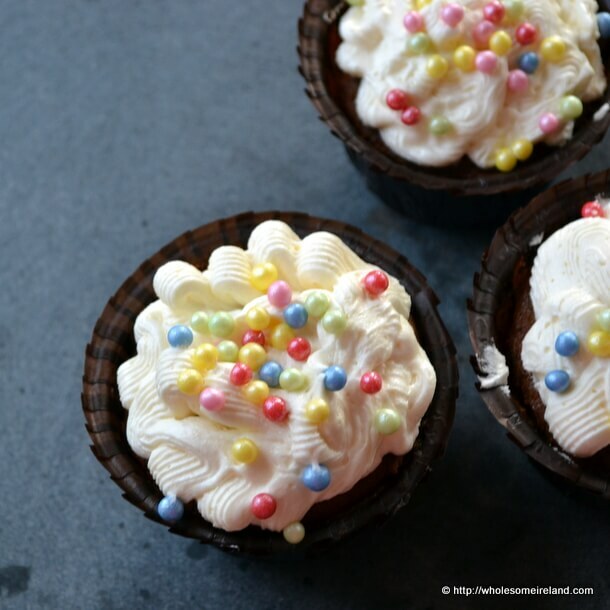 Preheat your (fan) oven to 150 degrees Celcius and line your cupcake tray with cases. Cream the butter and sugar together then add the treacle and mix in well. Beat the eggs into the mixture one by one until the batter is smooth and not lumpy. If it is lumpy then add a small spoon of the flour. Slowly beat in the flour, expresso, baking powder, cinnamon and ground ginger. The batter will become thick. Stir in the soaked mixed fruit and crystallised ginger. 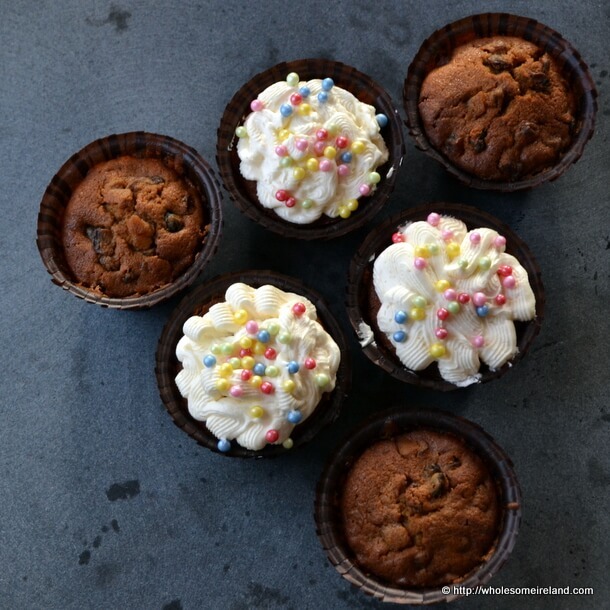 Divide the mixture equally between the cupcake cases and bake in the oven for approximately 40 minutes. After 40 minutes using a cocktail stick test the cakes by poking right into the centre, if they are baked then the cocktail stick will come away clean. If the stick does not come away clean then bake for a further 10 minutes and test again. Once cooked remove the cupcakes from the oven and sprinkle the top of each with whiskey and leave to cool covered with a clean tea towel. If you’re going to freeze the cupcakes, then once completely cool then (still inside the cases) bag them or box them before putting them into the freezer to protect them from burn. To ice/frost beat together 150g unsalted butter, 50ml full fat milk and 400g icing sugar. Flavour as you wish although perhaps a little whiskey in the icing might add a bit of zing! The expresso really lends an extra kick to the mixture I have to say! I love to soak fruit in alcohol! Just recently made a bundt cake with cherries soaked in cognac. I rarely soak fruit in alcohol, normally a fruit juice or tea but for Christmas Cake it has to be whiskey! I’d let defrost naturally Emily. Take them out the night before and leave in a cool, dry spot – not the fridge! Why thank you. How lovely of you to say so. Thank you for trying them out and I’m glad you enjoy the recipe! What inch tin do you use to make your Christmas cake on lidl leaflet. Hi Rachel it’s a 25 cm cake tin. Apologies for the typo in the leaflet.